Dhaka – The government has relentlessly been working for reducing the existing social and economic disparity to ensure equal opportunity for everyone irrespective of race, ethnicity, colour, creed and religion. “When we talk about our development, we certainly mean the inclusive development of every people irrespective of their religion, creed and caste,” Prime Minister Sheikh Hasina said on Thursday. 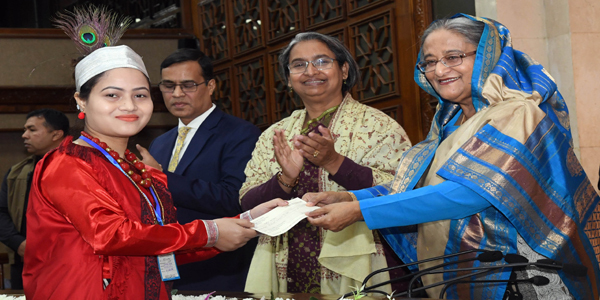 She made the comment while awarding scholarship among students belonged to ethnic minority communities of plain land at her office in Dhaka. The ethnic communities living in plain land have long been deprived for their constitutional rights thanks to a downbeat mindset despite the fact that Bangladesh’s constitution guarantee equal rights for everyone. 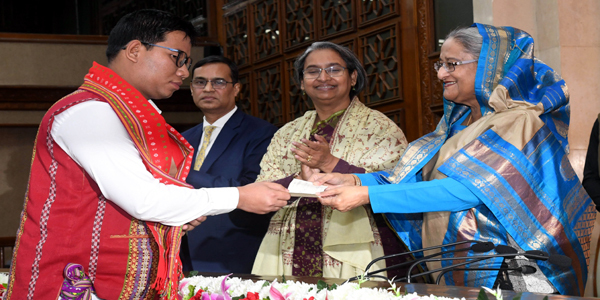 The government awarded scholarship to students of the ethnic groups, which are considered backward section in Bangladesh, to ensure their social inclusion. The Prime Minister’s office initiated the scheme titled -‘Development Assistance for the Small Ethnic Communities Living in Plain Land’ in 1996 to support the students of ethnic communities. The prime minister said promotion of the ethnic culture is very important side by side their economic prosperity. She said the government wants to ensure everyone gets equal opportunity to pursue education and use modern technology. “We are not only giving importance on development of ethnic minority but also working for changing the lots of the people of ‘bede’ community, hijra, tea garden workers and Dalits,” she said. Special allocation was given for their education, sanitation and supply of pure drinking water, she said emphasizing on conservation of the diversity of life style of ethnic groups. The scholarship would help the students to pursue their higher studies and flourish their talent, she said. Hasina said she has earnestly been trying to know the barriers of economic, social and political development of the people of Bangladesh and resolved those problems to give them a decent life ever since her inception in political career in 1981. Pointing out beauties of natural and demographic diversity of Bangladesh, Hasina said her government has given important focus on ethnic people for their socioeconomic development as well as culture diversity. She highlighted the 1996 peace treaty to resolve unrest in Chittagong Hill Tracts and creation of opportunity for the ethnic people of the region for their economic uplift. At the same time, 1,500,000 ethnic people living in plain land were also considered, she said adding that her government took up various projects to support them economically, promote their culture and create educational and other occupational opportunities. She urged the ethnic people to strive for further development of their traditional occupation through using modern technology saying ethnic people are part of our national and social heritage.